This category contains sensors with an electrical transmission output for remote indication of carbon dioxide level. There are products with optional relays. Applications of some of these products is ventilation. 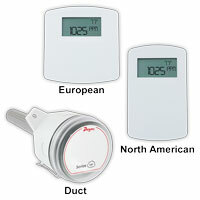 Duct Mount Carbon Dioxide Transmitter monitors the concentration of carbon dioxide in the return air duct. Applies to on demand room ventilation. Carbon Dioxide/Temperature Transmitter monitors the CO2 concentration and temperature in indoor environments to achieve energy savings. 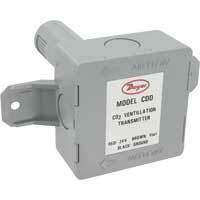 Carbon Dioxide/RH/Temperature Transmitter reduce the number of sensors mounted on a wall or in a duct. 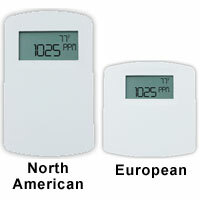 Display can be configured to show only temperature or relative humidity or CO2. Wall Mount Carbon Dioxide Transmitter is low cost and high performing. 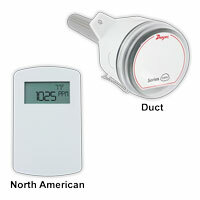 Provides energy savings and allows the user to effortlessly and effectively control fresh air. Communicating Carbon Dioxide Detector that is a combination of three room sensors into a single compact housing. LCD can be programmed.